Stardust Overdrive Special Edition combines 3 packs of the latest booster, Stardust Overdrive, with 1 of 2 powerful and highly sought-after cards: Charge of the Light Brigade or Tempest Magician! Charge of the Light Brigade: Originally released as a TCG World Premiere card in The Duelist Genesis, this card is a cornerstone of the Lightsworn Deck. Tempest Magician: This powerful Synchro Monster first appeared in Crossroads of Chaos and has the ability to use Spell Counters to inflict damage directly to your opponent. Both Charge of the Light Brigade and Tempest Magician have previously been available only as hard-to-find Secret Rare cards. 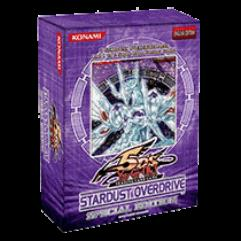 Now, Duelists everywhere can get their hands on these cards, with Stardust Overdrive Special Edition.